The Nintendo DSi is a dual-screen handheld gaming system from Nintendo. It's the third iteration of the Nintendo DS. The Nintendo DSi has some unique functions that set it apart from the Nintendo DS Lite and the original style Nintendo DS (often referred to by owners as the "Nintendo DS Phat"). The Nintendo DSi has two cameras that can snap pictures, and it can support an SD card for storage purposes. Additionally, the device can access the Nintendo DSi Shop to download games that are referred to as DSiWare. The DSi also has a downloadable Internet browser. The screens on the Nintendo DSi are slightly larger and brighter than the screens on the Nintendo DS Lite (82.5 millimeters versus 76.2 millimeters). The handheld itself is also thinner and lighter than the Nintendo DS Lite (18.9 millimeters thick when the system is closed, 2.6 millimeters thinner than the Nintendo DS Lite). The Nintendo DS library is playable on the Nintendo DSi, though there are a few notable exceptions. Unlike the original style Nintendo DS and the Nintendo DS Lite, the Nintendo DSi can't play games from the DS's predecessor, the Game Boy Advance. The lack of a Game Boy Advance cartridge slot on the Nintendo DSi prevents the system from supporting games that utilize the cartridge slot for an accessory (e.g., Guitar Hero: On Tour). The Nintendo DSi was released in Japan on November 1, 2008. It went on sale in North America on April 5, 2009. The 'i' in the Nintendo DSi's name isn't just there to look fancy. According to David Young, the assistant manager of PR at Nintendo of America, the 'i' stands for 'individual.' The Nintendo DSi, he says, is meant to be a personalized gaming experience versus the Wii, which was named to include the entire family. "My DSi is going to be different from your DSi — it's going to have my pictures, my music and my DSiWare, so it's going to be very personalized, and that's sort of the idea of the Nintendo DSi. [It's] for all of the users to personalize their gaming experience and make it their own." The Nintendo DSi can play games designed for Nintendo DS systems, except for games that come packed with an accessory that utilizes the Game Boy Advance cartridge slot. The Nintendo DSi can also go online with a Wi-Fi connection. Some games offer an online multiplayer option. The Nintendo DSi Shop, which has several downloadable games and applications, can also be accessed over a Wi-Fi connection. The Nintendo DSi has two cameras and is packed with easy-to-use photo editing software. It also has built-in sound software that lets users record sounds and play with ACC-format music uploaded to an SD card (sold separately). The SD card slot allows for the easy transfer and storage of music and photos. 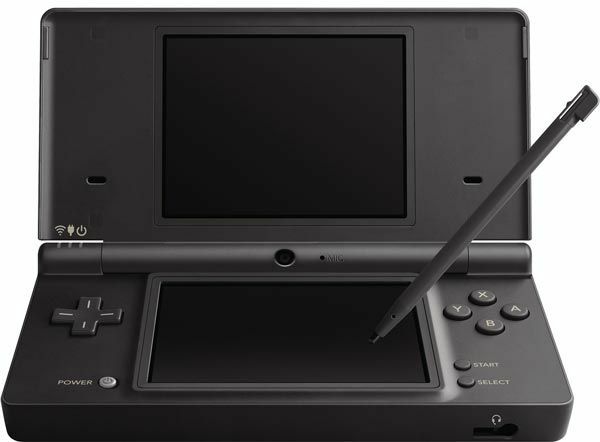 Like the original style Nintendo DS and the Nintendo DS Lite, the Nintendo DSi comes installed with the PictoChat picture-chat program, as well as a clock and an alarm. Most of these downloadable programs, called DSiWare, are bought using Nintendo Points. Nintendo Points can be bought with a credit card, and prepaid Nintendo Points cards are also available at some retailers. The Nintendo DSi Shop offers a free downloadable internet browser. Some versions of the Nintendo DSi come bundled with Flipnote Studio, a simple animation program that's also available to download for free on the Nintendo DSi Shop. The Nintendo DS's game library is large and varied and includes action games, adventure games, role-playing games, puzzle games, and educational games. The Nintendo DSi also has access to DSiWare, downloadable games that are typically cheaper and a little less complex than a typical game purchased at a brick-and-mortar store. Games that show up on DSiWare often show up on Apple's app store, and vice versa. Some popular DSiWare titles and apps include Bird and Beans, Dr. Mario Express, The Mario Clock, and Oregon Trail. Some Nintendo DS games utilize the Nintendo DSi's camera function as a bonus feature — for instance, using a picture of yourself or a pet for the profile of a character or enemy. The Nintendo DSi plays most of the Nintendo DS's library, meaning DSi games cost the same as a typical DS game: approximately $29.00 to $35.00 USD. Used games can be found for less, though used game prices are set individually by the seller. A DSiWare game or application generally runs between 200 and 800 Nintendo Points. Sony's PlayStation Portable (PSP) is the Nintendo DSi's main competitor, though Apple's iPhone, iPod touch, and iPad also present significant competition. The Nintendo DSi Store is comparable to Apple's App Store, and in some cases, the two services even offer the same games.